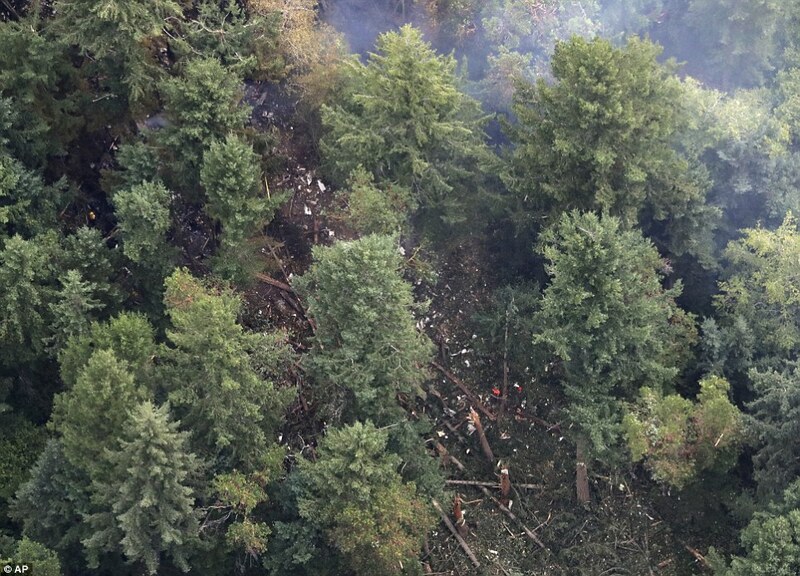 The aftermath of the deadly crash caused by a suicidal baggage handler who stole an empty passenger plane and flew it into an island on the Puget Sound on Friday was laid bare on Sunday in aerial images of the wreckage. 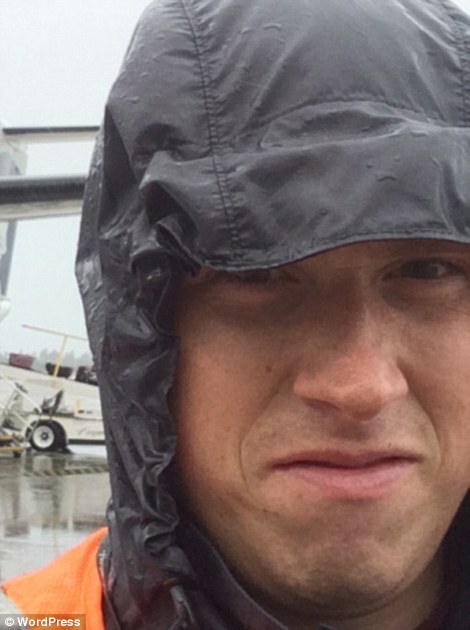 Richard Russell, 29, was a 'bored' baggage handler at Seattle's International Airport. 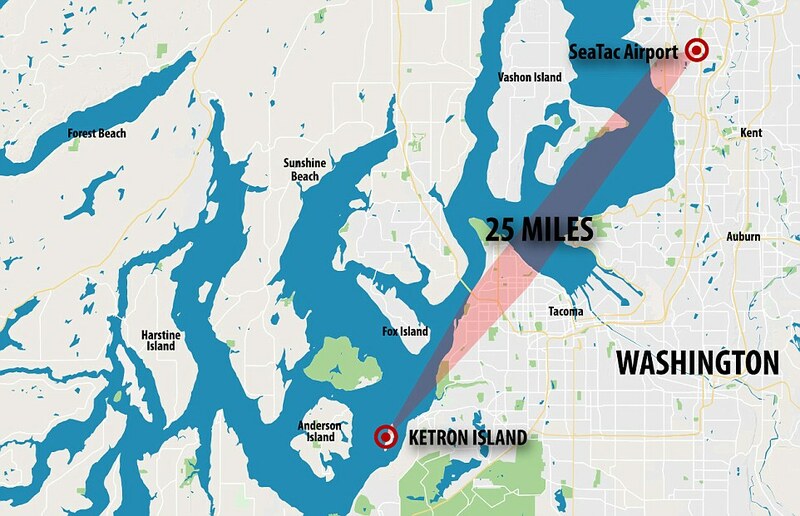 On Friday, he stole a 76-seater plane from the airport where he worked and flew for an hour, performing a loop-the-loop, before crashing it into Ketron Island. No one else was injured or killed but Russell, who was married, died in the crash. On Sunday, his remains were recovered from the crash site along with the plane's flight data recorder and the voice recorder. 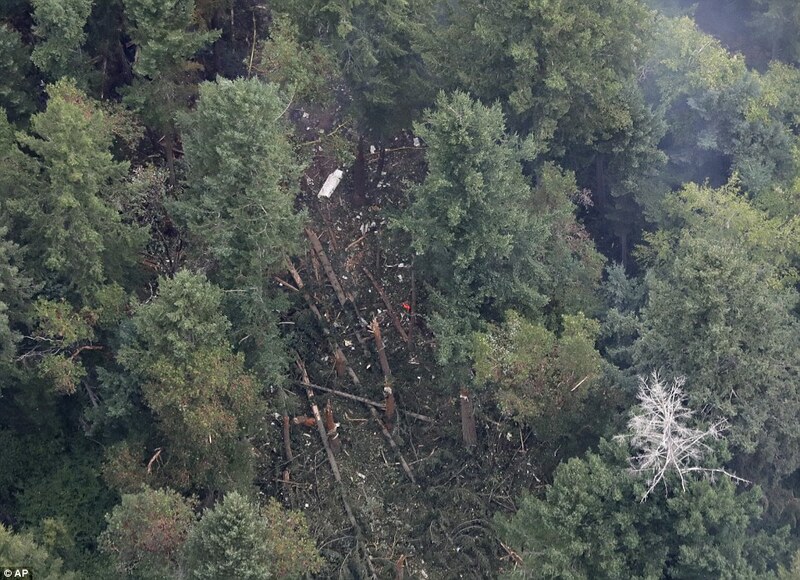 The plane shattered into hundreds of pieces upon impact and was unrecognizable on Sunday as authorities worked through it. Before crashing, Russell joked with air traffic controllers that he did not know how to land the aircraft but knew how to fly it because he had played 'some video games'. He described himself as a 'broken guy with a few screws loose,' and apologized to his friends and family who have since told of their shock. During the hour he spent in the air, Russell flew the plane in a loop - an improbable stunt caught on video by a surprised bystander - then slammed it into Ketron Island in Puget Sound. No one besides Russell was hurt, and two F-15s which were scrambled to try to bring him down, never fired a single shot. 'You couldn't even tell it was a plane except for some of the bigger sections, like the wing section. 'Even the small sections, most of it doesn't resemble a plane,' National Transportation Safety Board Western Pacific Region chief Debra Eckrote said. Russell, who was known affectionately as 'Beebo' by friends and family, was remembered as 'quiet' and 'very friendly'. He had worked at the airport for three-and-a-half-year before Friday's incident. Beforehand, he ran a business with his wife in Oregon. 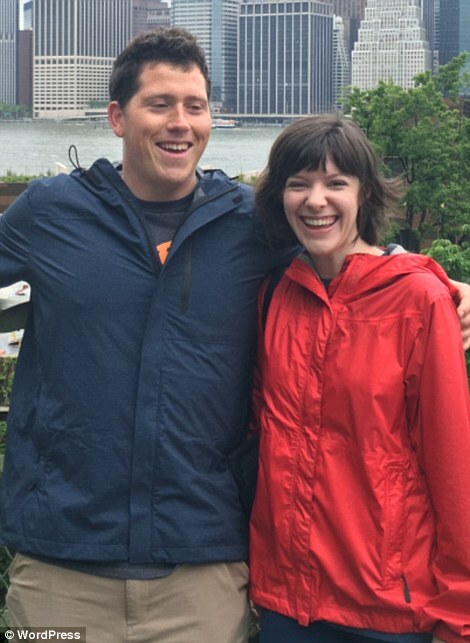 They were successful for three-and-a-half years but closed the bakery in 2015 after being featured in local news outlets as a happy, aspirational couple. 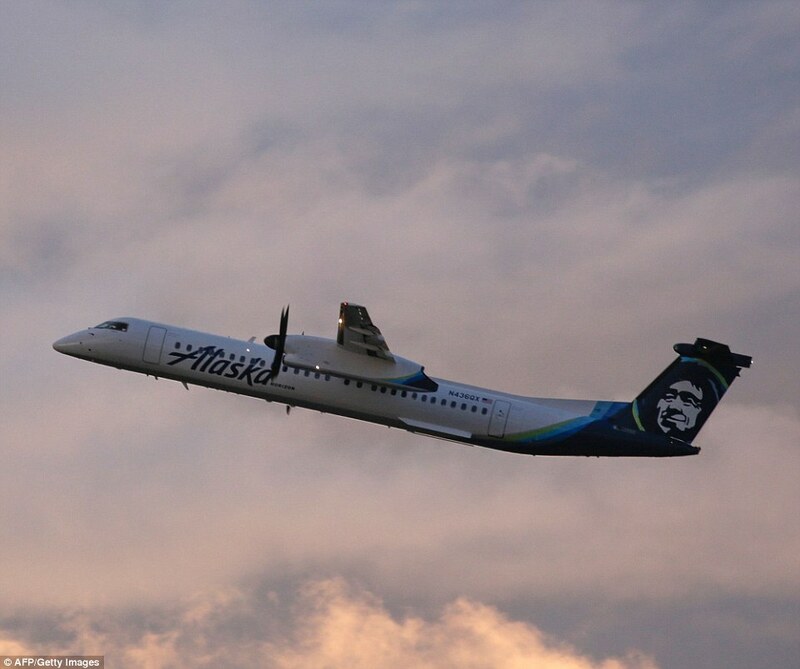 Questions have now emerged around how he was able to gain access to the aircraft which belonged to Horizon Airlines, the sister airline of Alaska Airlines. Russell had no criminal background and passed background checks before he started work at the airport. Aviation experts have since told how it is easy for someone with access to a hangar or airport to steal a plane because aircrafts do not operate with keys and are instead controlled by switches. 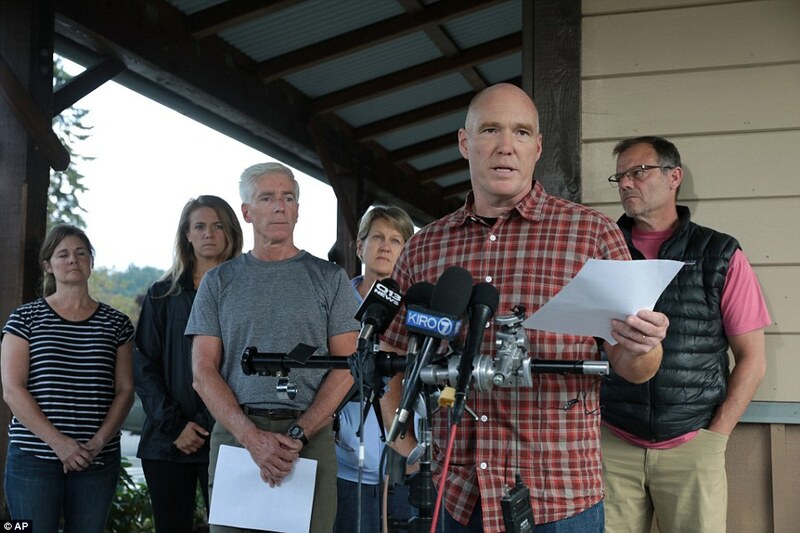 Alaska Airlines, which owns Horizon, has said it is working closely with the FBI and NTSB to determine how he was able to get access to the plane and if it could have been prevented. Shortly after the plane took off, traffic controllers were heard on an Internet livestream speaking to a man identified as 'Rich'. 'There is the runway just off your right side in about a mile, do you see that?' the traffic controller said. Rich: I've got a lot of people that care about me. It's going to disappoint them to hear that I did this. Rich: I'm down to 2,100, I started at like 30-something. Air traffic control: Rich, you said you had 2,100 pounds of fuel left? Rich: Yeah, I don't know what the burnage, burnout? Is like on a takeoff, but yeah, it's burned quite a bit faster than I expected. Air traffic control: Right now he's just flying around, and he just needs some help controlling the aircraft. Rich: Nah I mean, I don't need that much help. I've played some video games before. I would like to figure out how to get this… make it pressurized or something so I'm not lightheaded. Rich: Damnit Andrew, people's lives are at stake here. Air traffic control: Ah Rich, don't say stuff like that. Rich: I don't want to hurt anyone, I just want you to whisper sweet nothings into my ear. Rich: Hey do you think if I land this successfully Alaska will give me a job as a pilot? Air traffic control: If you wanted to land, probably your best bet is that runway just ahead and to your left. Again, that's McCourt (sic) Field. If you wanted to try, that might be the best way to set up and see if you can land there. Or just like the pilot's suggestion, the other option might be over Puget Sound, into the water. Rich: Dang, did you talk to McCourt, cause I don't know if I'd be happy with you telling me I could land like that, cause I could really mess some stuff up. Air traffic control: Well Rich I already talked to 'em. Just like me, what we want to see is you not get hurt, or anyone else get hurt. So if you want to try to land, that's the way to go. Rich: Hey I want the coordinates of that orca, you know, the mama orca with the baby. I want to see that guy. Rich: Hey, is that pilot on? I want to know what this weather is going to be like in the Olympics (mountains). Air traffic control: Well, if you can see the Olympics, the weather's good. I can see the Olympics from my window, and it looks pretty good over there. Rich: Alright, 'cause I felt some, what felt like turbulence around Rainer, but there was no clouds hardly. Air traffic control: Oh, that's just the wind blowing over all over the bumpy surfaces there. Captain Bill: Alright Rich, this is Captain Bill. Congratulations, you did that, now let's try to land that airplane safely and not hurt anyone on the ground. Rich: Alright, damnit, I don't know man, I don't know. I don't want to… I was kind of hoping that would be it, you know. Rich: I'm gonna land it, in a safe kind of manner. I think I'm gonna try to do a barrel roll, and if that goes good, I'm just gonna nose down and call it a night. Air traffic control: Well Rich, before you do that, let's think about this. I've got another pilot coming up, pilot Joel, in just a minute here I hope. And we'll be able to give you some advice on what to do next. Rich: I feel like one of my engines is going out or something. Air traffic control: OK Rich, if you could, you just want to keep that plane right over the water. Maybe keep the aircraft nice and low. Rich: Just kind of lightheaded, dizzy. Man, the sights went by so fast. I was thinking, like, I'm going to have this moment of serenity, take in all the sights. There's a lot of pretty stuff, but they're prettier in a different context. Air traffic control: Do you have any idea of how much fuel you have left? Rich: Oh man, not enough. Not enough to get by. Like, uh, 760? 760 pounds? Air traffic control: Just flying around the plane, you seem comfortable with that? Rich: Oh hell yeah, it’s a blast. I’ve played video games before so I know what I’m doing a little bit. Air traffic control: OK, and you can see all the terrain around you, you’ve got no issue with visibility or anything? Rich: Naw, everything’s peachy, peachy clean. Just did a little circle around Rainer, it’s beautiful. I think I’ve got some gas to go check out the Olympics (mountains). Rich: I wouldn’t know how to land it, I wasn’t really planning on landing it. Rich: Sorry, my mic came off, I threw up a little bit. I’m sorry about this, I hope this doesn’t ruin your day. Rich: Man, have you been to the Olympics? These guys are gorgeous, holy smokes. Air traffic control: Ya, I have been out there, it’s always a nice drive. Air traffic control: Hey I bet you do. I haven’t done much hiking over there. But if you could start a left turn, and back towards the east. I know you’re getting a good view there, but if you go too much farther in that direction I won’t be able to hear you anymore. Rich: Hey pilot guy, can this thing do a backflip, you think? Rich: I wouldn’t mind just shooting the s**t with you guys, but it’s all business, you know? 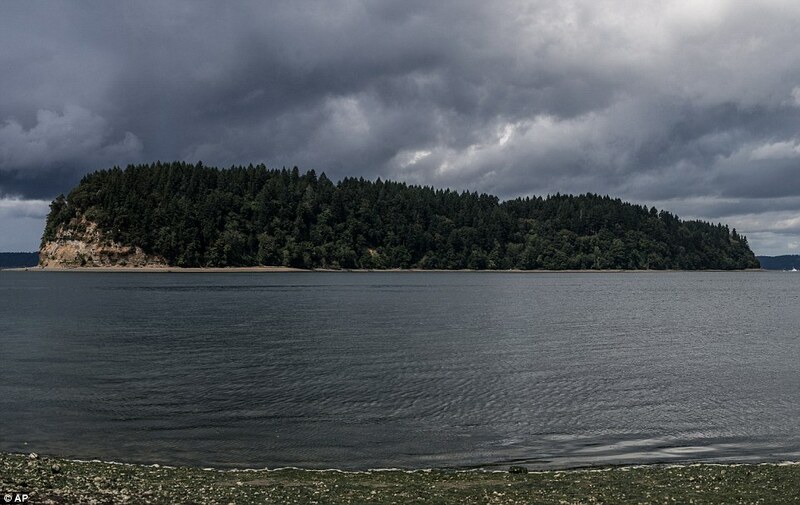 Ketron Island is a small, 221-acre piece of land located in the southern Puget Sound. 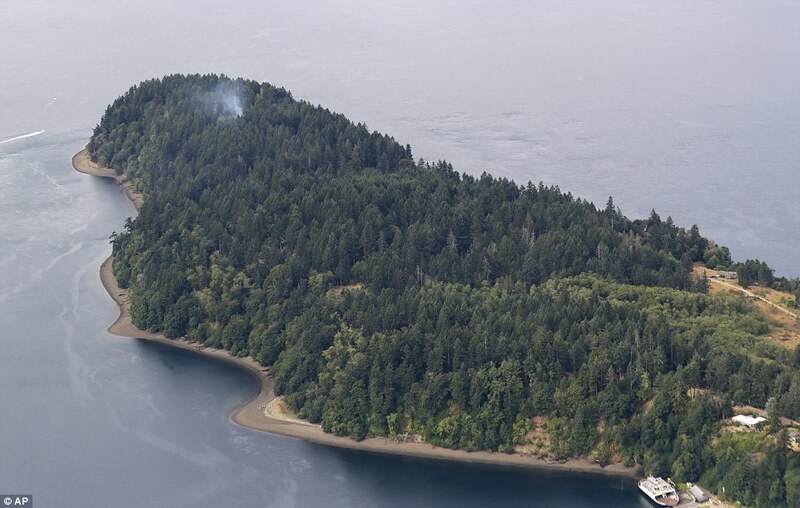 The island is privately owned and can only be reached by ferry. In 2010, the last time the federal government published the results of its census, the island's population was just 17 people. Russell's family said the incident came as a 'complete shock'. 'It may seem difficult for those watching at home to believe, but Beebo was a warm, compassionate man. It is impossible to encompass who he was in a press release. He was a faithful husband, a loving son, and a good friend. 'A childhood friend remarked that Beebo was loved by everyone because he was kind and gentle to each person he met. 'This is a complete shock to us. We are devastated by these events and Jesus is truly the only one holding this family together right now. 'Without Him we would be hopeless. As the voice recordings show, Beebo’s intent was not to harm anyone and he was right in saying that there are so many people who love him,' they said. In 2017, he uploaded a video to YouTube where he complained about the monotonous nature of his job. The airline has expressed its condolences for his family. 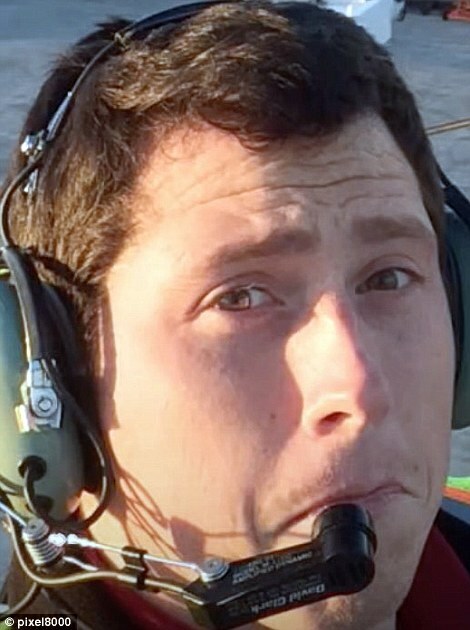 Rick Christenson, retired from Horizon Air, told the DailyMail.com that Russell was 'quiet' and 'a nice kid'. Christenson didn't supervise Russell's team, but said he saw the 29-year-old in passing while at work. The final YouTube video posted by a Seattle plane hijacker depicts a happily married man with a monotonous job that's only silver lining was the travel opportunities it afforded him. Richard Russell, 29, stole an Horizon Airlines jet from the Seattle-Tacoma Airport and took it for an hour-long joyride before crashing on an island in a ball of flames on Friday evening. A video posted to Russell's amateur travel blog in December 2017 provides an intimate view into his life as a grounds service agent for Horizon Airlines, a job that consisted primarily of loading and unloading luggage, paying only $13.75 per hour. 'Hi, I'm Beebo Russell and I'm a grounds service agent. That means, I lift a lot of bags. Like, a lot of bags. So many bags,' he narrates over back-to-back clips of suitcases being loaded on and off of airplanes as a lighthearted tune plays in the background. 'Look at all them bags. Ooh, a purple one,' he says cheekily. Ok, now tell us the Dr. prescribed drugs he was on. guy highjacks a plane right off the runway. incredible acrobatics are performed by the non pilot. big plane crashes producing only a tiny puff of smoke. nothing but very tiny pieces of the plane remaining. 2 photos of the guy look like 2 different guys. ya something is wrong with this story. Reportedly baggage handler is a Mohamed Ata Flight Academy graduate.